Can you really grow food year-round? I’ve been trying to grow food year-round in our zone 5 Canadian climate, even with the heavy wet snowfalls and temperatures that dip down to -20C/-4F for years now. Although growing food year-round might seem like a lot to learn at first, and requires some financial setup costs if you’re using season extenders, it’s really worth the time and money investment if you’re serious about home food production or eating a healthy local diet. Extending your growing season is one of the best ways to get more from your garden, especially in short season climates. Planting the right crops can add weeks to your growing season. I’ll discuss what these vegetables are that can handle frosts and snow. I also go into overwintering veggies and growing indoors if season extending isn’t possible for you. The best time to season extend is in the spring and fall, and if you’re feeling extra adventurous, the winter months even with the snow. (be prepared for a work out shoveling snow!). Let’s learn how to grow year-round! 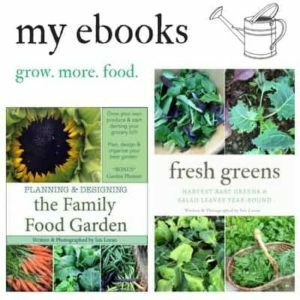 Edited: Since writing this post I’ve written a book on growing greens year-round as they are a super easy crop to focus on when learning how to grow year-round. 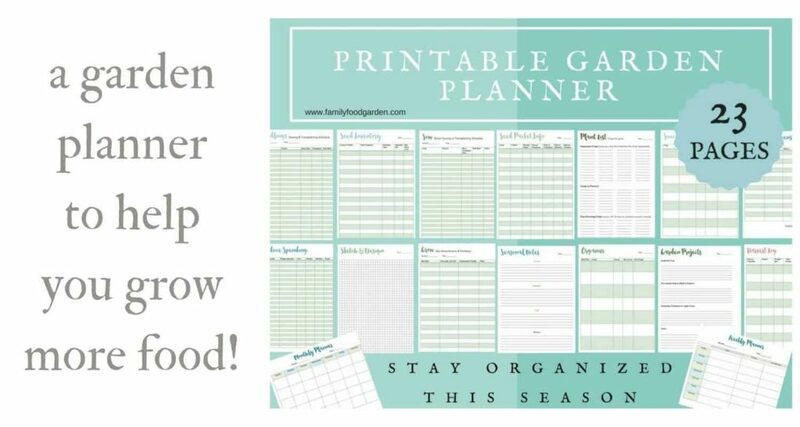 Also when growing year-round it really helps to stay super organized, which is why I created the ultimate garden planner. 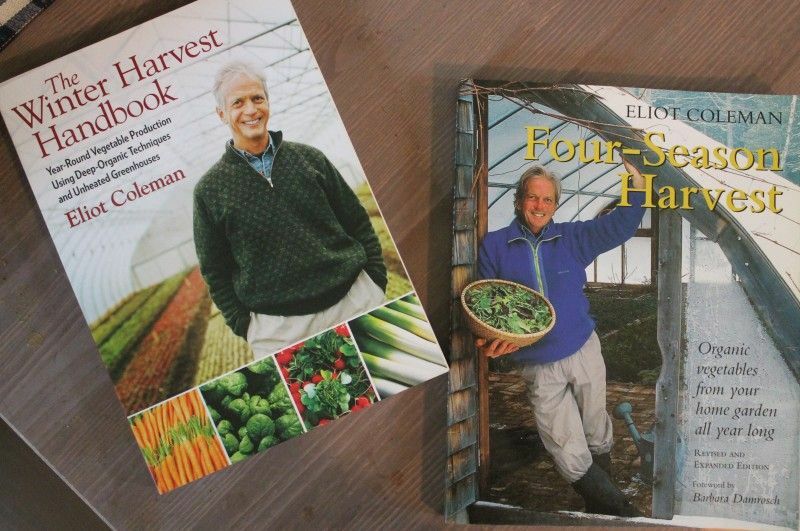 I’ve also written on growing year-round in an unheated greenhouse. Believe it or not, there are many crops that can handle frosts, harder freezes and snow. 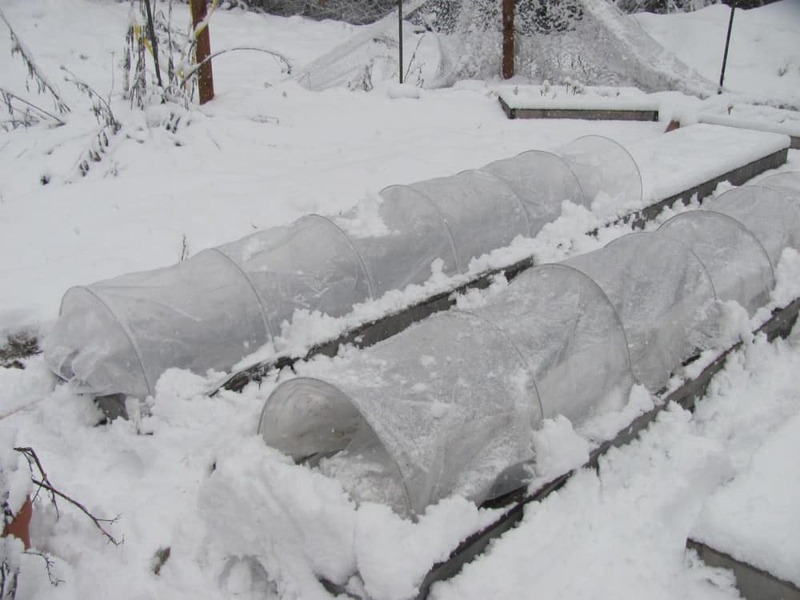 Some even without the protection of season extenders (Learn what cold hardy crops to grow). However, if you want to grow food when the temperatures get really low then you’ll benefit from using season extenders so long as you select the right crops. The days get hotter and longer in the spring so you’ll want to choose cool season crops that are bolt-resistant in the spring. In the fall and winter you’re selecting varieties that are cold hardy as the days get colder with shortened daylight. 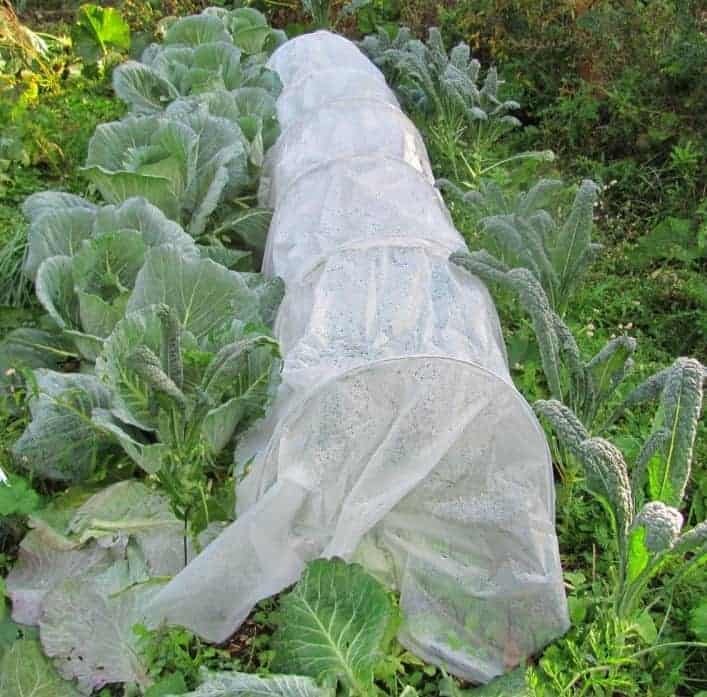 Lettuce for example is not very cold hardy but if you grow varieties like ‘Rouge D’hiver’ or ‘Winter Density’ you can harvest in the colder months under tunnels. The same thing goes for springtime, choosing bolt-resistant varieties will help with the increasing heat. 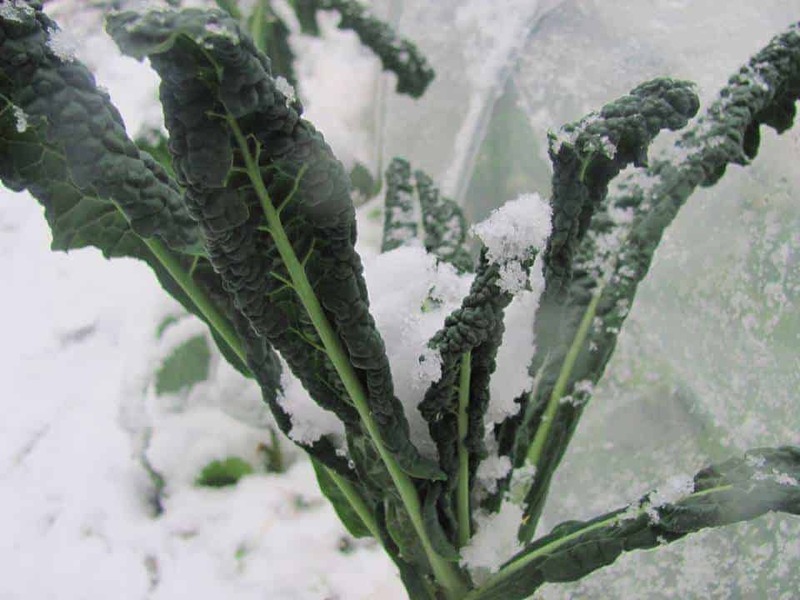 Cool season vegetables thrive in cool temperatures but are less likely to withstand light or hard frosts. 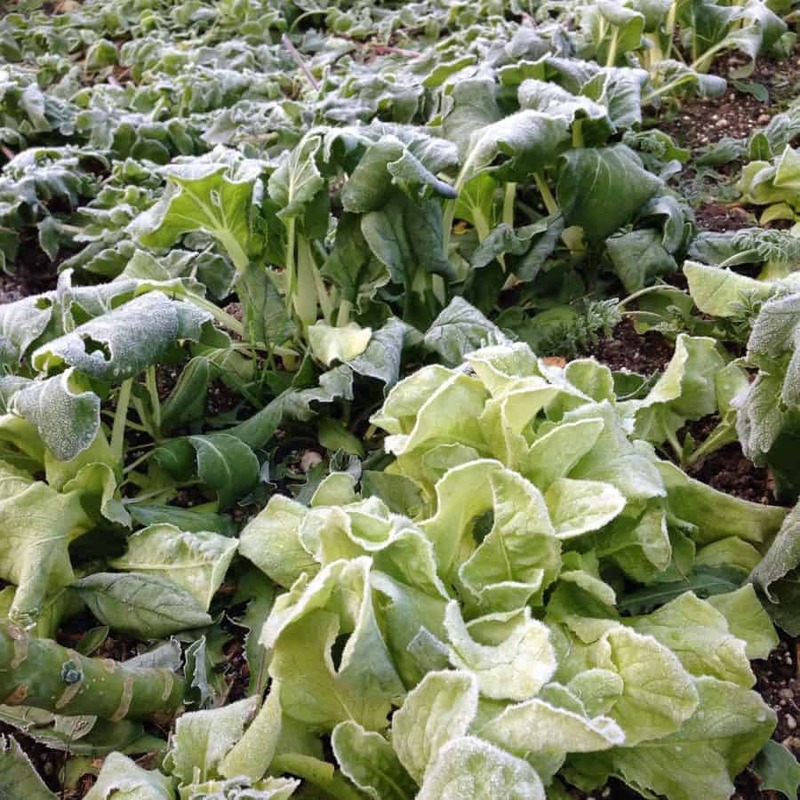 Cold hardy vegetables can handle light or hard freezes, and may even overwinter under the snow for a spring harvest. Now this does depend on your climate & growing zone. Arugula, beet, broccoli, cauliflower, cabbage, celeriac, chinese cabbage, carrots, swiss chard, chicory (endive, frisee and radicchio), collards, fava bean, Florence fennel, garlic, shallots, kale, leek, lettuce, Asian/mustard greens, spinach, mache, mesclun greens, green onions, bok/pak choi, parsnip, pea, potato, radish, rutabaga, salsify, tatsoi. 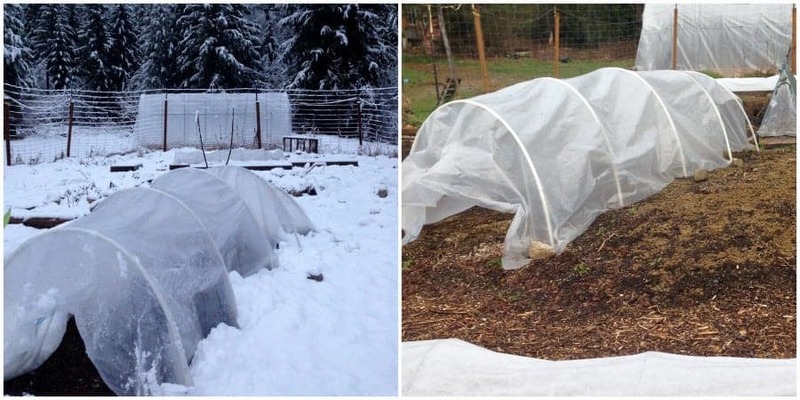 The cool season and cold hardy vegetables both benefit from added mulch, mini hoop tunnels, cold frames, greenhouses or heavyweight row covers. 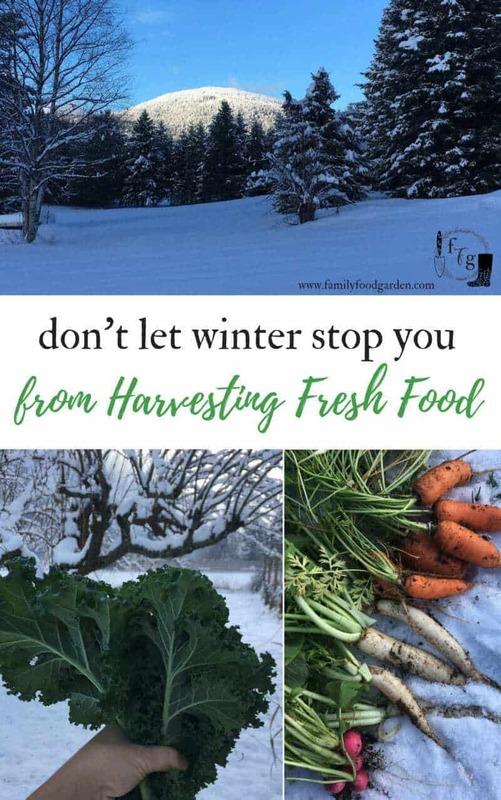 Root veggies often taste sweeter after heavy frosts! We’ve grown carrots, parsnips, turnips and beets for a fall harvest and have left them without protection (although mulching would extend the harvest). We’ve even harvested potatoes that were deep in the ground all winter and harvested in the early spring before they sprouted. Here’s my guide to growing root vegetables year-round. Using season extenders might take a little practice but I promise you they’re worth the time to learn (plus the start up cost). One of the most important things to remember is to vent your season extenders, the very thing that allows you to keep your crops warmer on the colder days can also get too hot. Venting is key to allowing good airflow and making sure your plants aren’t stressed from the heat; many cool season plants can’t handle and may even try to go to seed (bolt). The image below from Fix.com gives you a good idea of venting, although I strongly disagree with the row cover not needing venting; they definitely do and should be closed at both ends when it gets cold/below 0. In general temperatures above 3C/37.4F needs venting, especially with sunshine. I often don’t put season extenders on until it dips below 0 in the fall to make the plants stronger for the winter. Practice getting the right sowing times and varieties. Every local climate will be different and need slight adjustments. I use this table from West Coast Seeds as a guideline for sowing and transplanting times. Learn when to sow your seeds and start your transplants here. Use transplants to get a head start in the spring and fall. Your crops will especially come sooner in the spring with transplants under tunnels! Succession sowing every week over multiple weeks will help you get the right timing for your crops. You may get heat waves in the spring and fall which cause your plants to bolt. Sowing multiple times helps you still get crops that don’t go to seed. Restore the soil! Season extending means you’re growing more crops in a single growing season. It’s important to make sure you restore the soil in-between sowings otherwise your crops won’t have enough nutrients to grow. This is especially important in the fall because they need to grow fast before the cool weather sets in and because of Persephone days. Garden planning and timing is just as important as which varieties you plan to grow in your fall garden. Can you Really Grow Food Year–round, 365 days a year? YES. Even with a zone 2 climate, you can grow indoors if you’re not up to/it’s too cold to garden outdoors!! 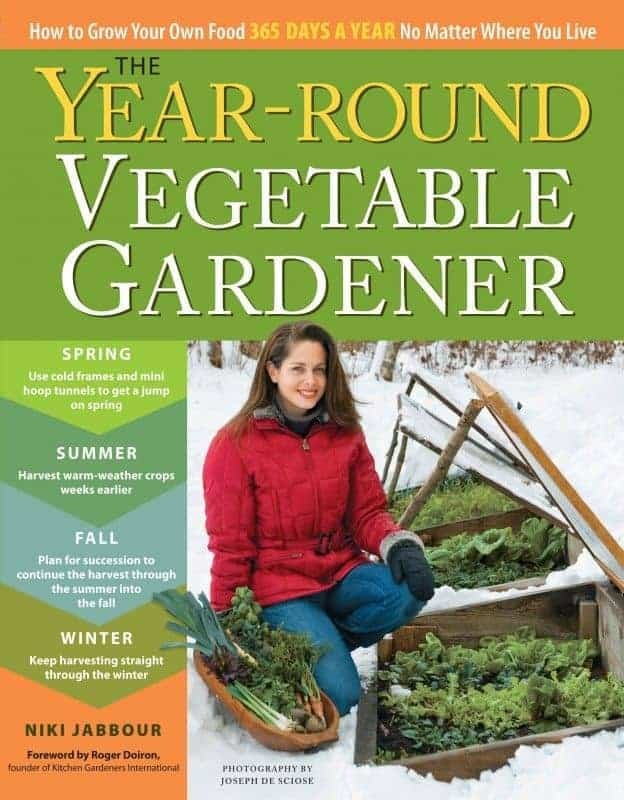 Growing food year-round with season extenders can give you weeks more growing time in your garden. I’ve been doing it for years now, experimenting with different varieties and season extenders in our colder northern climate and I can tell you it’s amazing to harvest green food when there’s snow on the ground! Do you try and grow food year-round? What are your fav cold hardy varieties to grow? Hungry for More Season Extending Info? I would like to use this article in my monthly newsletter for an assisted living community. I also want to promote your book. I’m the activities director and I’m quitting to start a home stead. 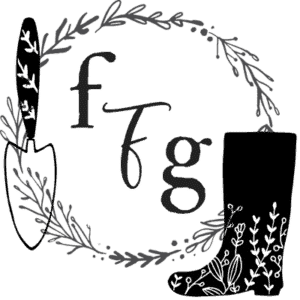 Many of the residents have asked me exactly what I’m planning to do on the homestead and I think your blog about what to do all year perfectly covers it. I don’t want to infringe on copyright laws because I honestly don’t understand them completely. I read somewhere that I had to have permission. May I please have your permission! I’ll include your name and book. 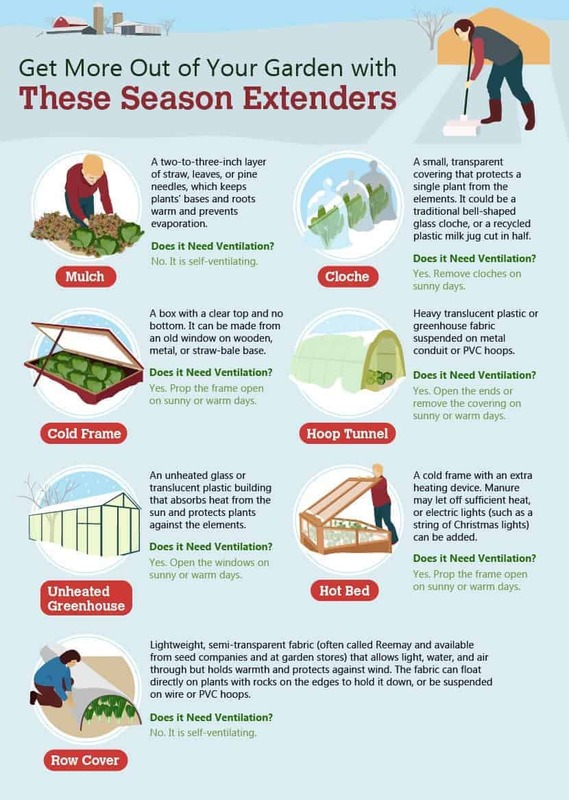 Excellent tips with regards to ventilation. I think I overlooked the importance of this in a previous hoop tunnel project as it wasn’t hugely successful. Planning on having another (better) bash at it later this year. Thank you very much for the article – some very useful Winter tips here! Thanks for putting this together. There is some very useful information that I hope to put to use in the near future. Thanks Steve. I am in Ohio also and just getting started with gardening. I tried this year and it went, well, not as great as I would have liked:-) It shows me just how much I have to learn. I’m going to be more selective in the plants that I target this next growing season. Also, thanks for the homemade insect repellent! I am always on the lookout for more natural solutions. I have tried Winter gardening with some success for the past two years. We are in zone 8a. Everything does great over the winter and starts growing once the weather warms up in early spring. That said every year around first week of March all my brassica family with the exception of colored greens freaks out and start bolting. I tried small seedlings, so that they can start growing when the weather warms up and I tried half mature plants, so that they can continue growing until end of April or so. Both bolted. 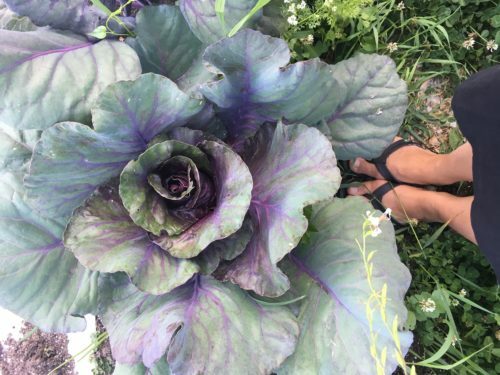 My cabbage had may be a week to get hard (head) and BAM one day was gone bolting. I read that you recommend to use “non bolting”varieties. Is this all to it? I bought my previous plants ready to go from the nurseries, thinking they will know what will survive. Should I start them early enough that they are fully mature to eat over winter and collect all left behind before March? It makes me so happy that you’re winter gardening. In zone 8 your crops will definitely bolt by the spring regardless of age, one might just give you an extra week or two. Our fall & winter sown ones (zone 5) ALWAYS do within a couple of weeks of producing early spring greens (which is happening right now, so the bolting is usually April). That is the downside of fall and winter crops, by the spring they are at the end of their lifecycle so just amend the bed and sow/transplant spring crops. It’s tricky because the bolt resistant varieties tend to be less cold hardy and crops will bolt if they experienced cold/winter as they’re suppose to go to seed in their second year. I recommend sowing bolt resistant varieties in the spring because of the warming days, your seed catalogs/seed packets will mention which ones have better bolt-resistance, however for fall & winter gardening you want the cold hardy ones (although in zone 8 it might not be that cold during the winter?). If you transplant seedlings too early in the spring or if you get a cold snap after transplanting sometimes the crops ‘think they went through a winter’ and will bolt too. Bolt resistance helps, but isn’t a guarantee, but they can usually handle more stress than other varieties. I’m planing to make a winter gardening this year and I don’t know what to do or where to start with! Thanks for sharing your useful tips! Now I just need to do it right away!